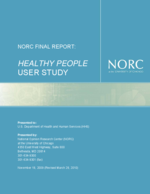 In 2007, the Office of the Assistant Secretary for Planning and Evaluation (ASPE) at the U.S. Department of Health and Human Services (HHS) contracted with the National Opinion Research Center (NORC) to conduct the 2008 Healthy People User Study. The study serves two purposes. First, it builds on findings from a similar study of Healthy People users conducted in 2005, which allows HHS to examine changes over time. Second, it informs HHS about patterns of awareness and usage of the initiative among state, local and tribal health organizations. Specifically, the results document the extent of awareness; describe the nature of use and assess whether use is changing over time; identify barriers to use among these critical audiences; and offer insight to assist in the development of the next iteration of Healthy People, Healthy People 2020. Healthy People 2020 is using current evidence and data, as well as lessons learned from Healthy People 2010, to establish new national health objectives reflective of evolving public health priorities. The process of developing Healthy People 2020 relies on input from the initiative’s key stakeholders to ensure a product that is responsive to the needs of its users. The development of Healthy People 2020 is well underway with release of the initiative’s overarching framework scheduled in 2009 and the release of health objectives planned for 2010. The results of the 2008 Healthy People User Study provide HHS with important information on the utilization of Healthy People 2010, and for the development of Healthy People 2020. First, results of the study indicate that awareness and use of the Healthy People initiative is very high among key stakeholders, with overall use of the initiative increasing since the 2005 study. The results also show that both non-users and users of Healthy People 2010 were more likely to cite issues related to their organization/agency as a barrier to greater use of the initiative, as opposed to issues related to the Healthy People initiative itself. However, it is important to recognize that some barriers associated with the initiative itself are impacting key stakeholders’ use of the initiative, such as the lack of implementation guides. Finally, study respondents expressed distinct, and conflicting, preferences regarding the format and content of Healthy People 2020, which suggests that Healthy People is utilized by different organizations in different ways. Overall, 91 percent of the responding organizations/agencies were aware of the initiative. This percentage shows an increase from the 83 percent who were aware of the initiative during the 2005 User Assessment. Of the 327 organizations/agencies that were aware of Healthy People 2010, 78 percent reported using it in their organization/agency. This is an increase from the 71 percent of organizations/agencies that reported use of the initiative in the previous study; though not a statistically significant increase. Over 81 percent of users in each sample type reported using Healthy People 2010 as a data source, to support applications for grants or funding, and as a framework for planning, goal-setting and agenda building. The data revealed variation between respondent types pertaining to the aspect of the initiative that is most useful. State level respondents cited the specific health objectives, MTAHB respondents reported leading health indicators, tribal health organization respondents cited the overarching goals, and local health organization respondents indicated data resources and the leading health indicators to be the most useful aspect of Healthy People 2010. Eighty percent of tribal health organizations reported intentionally planning programs around one or more of the Healthy People 2010 objectives. This was substantially higher for the other Healthy People 2010 respondent types. In terms of barriers related to the Healthy People initiative, the most commonly reported barrier by users of Healthy People 2010 was lack of data to track objectives (32 percent). In terms of barriers related to the respondent’s organization/agency, insufficient resources was the most commonly cited barrier (76 percent). Almost 60 percent of non-users indicated that a lack of implementation guidance was a barrier to greater use of Healthy People 2010. Notably, the proportion of respondents reporting each type of barrier greatly decreased from 2005. Overall, 47 percent of Healthy People 2010 users felt that fewer focus areas should be included in Healthy People 2020. Overall, 70 69 percent of Healthy People 2010 users indicated that a reorganization of Healthy People would be useful for the next iteration. When asked which format for organizing objectives would be most useful, 37 percent of Healthy People 2010 users felt it would be most useful to reorganize by risks/determinants (such as tobacco use, genetics, physical environment), 31 30 percent felt it would be most useful to reorganize by disease area, and 12 percent felt it would be most useful to reorganize by life stages. Overall, Healthy People 2010 users reported that they are most likely to use Healthy People 2020 as a framework for planning, goal-setting or decision making (79 percent). Healthy People 2010 users report that they are least likely to use Healthy People 2020 as a guide to set spending priorities within their organization (42 percent). Awareness and use of Healthy People has grown over time, but there continues to be a need for targeted efforts directed toward local and tribal health organizations. User groups utilize Healthy People differently and for different purposes. These variations indicate that there may be opportunity for expanded use of the initiative as users learn of other users’ Healthy People activities. The variations also indicate there is a continued need for targeted outreach efforts to support continued expansion of Healthy People utilization. Barriers to use or increased use of Healthy People are primarily attributed to organizations/agencies, rather than the Healthy People initiative itself. This distinction may be useful when developing outreach efforts to encourage greater use of the initiative. The lack of implementation guidelines is the leading barrier to use among non-users of Health People. The extent of this barrier shows an important need that is not being fulfilled by the initiative. In addition to outreach to tribal health organizations, MTAHB’s appear to be an effective avenue for communication with tribal health organizations. Chronic Disease Directors have similar levels of awareness and use of Healthy People as HP Coordinators, indicating that Federal outreach to states is effective and extends beyond HP Coordinators. To further improve Healthy People and its usability, Healthy People 2020 should include implementation guides and evidence-based practices, and HHS should increase communication with stakeholders to ensure users are aware of the complete spectrum of uses of Healthy People (rather than users continuing to use Healthy People only in the ways previously established by their organization/agency).